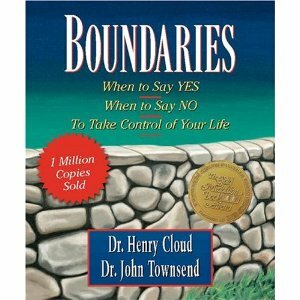 BOUNDARIES – What Are They? Boundaries define us. They define what is me and what is not me. A boundary shows me where I end and someone else begins, leading me to a sense of ownership. Knowing what I am to own and take responsibility for gives me freedom. We are responsible to others and for ourselves. “Carry each other’s burdens, ” says Galatians 6:2, “and in this way you will fulfill the law of Christ.” This verse shows our responsibility to one another. Boundaries help us to distinguish our property so that we can take care of it. In short, boundaries help us keep the good in and the bad out. Boundaries are not walls. The Bible does not say that we are to be “walled off” from others; in fact, it says that we are to be “one” with them (John 17:11). We are to be in community with them. But in every community, all members have their own space and property. The important thing is that property lines/boundaries be permeable enough to allow passing in and out, but strong enough to keep out danger. Truth – Knowing the truth about God and His property puts limits on you and shows you His boundaries. To be in touch with God’s Truth is to be in touch with reality, and to live in accord with that reality makes for a better life (Ps. 119:2, 45). Satan is the great distorter of reality. Honesty about who you are gives you the biblical value of integrity. Time – Taking time off from a person, or a project, can be a way of regaining ownership over some out-of-control aspect of your life where boundaries need to be set. Emotional Distance – Emotional distance is a temporary boundary to give your heart the space it needs to be safe; it is never a permanent way of living. Sometimes in abusive marriages the abused spouse needs to keep emotional distance until the abusive partner begins to face his or her problems and become trustworthy. You should not continue to set yourself up for hurt and disappointment. If you have been in an abusive relationship, you should wait until it is safe and until the real patterns of change have been demonstrated before you go back. Many people are too quick to trust someone in the name of forgiveness and not make sure that the other is producing “fruit in keeping with repentance” (Luke 3:8). Forgive, but guard your heart until you see sustained change. Other People – You need to depend on others to help you set and keep boundaries. For many, a support system gives the strength to say no to abuse and control for the first time in one’s life. There are two reasons why you need others to help with boundaries. The first is that your most basic need in life is for relationship. The other reason we need others is because we need new input and teaching. Boundaries are not built in a vacuum; creating boundaries always involves a support network. Consequences – Trespassing on other people’s property carries consequences. “No Trespassing” signs usually carry a threat of prosecution if someone steps over the boundaries. The Bible teaches this principle over and over, saying that if we walk one way, this will happen, and if we walk another way, something else will happen. Just as the Bible sets consequences for certain behaviors, we need to back up our boundaries with consequences. God does not enable irresponsible behavior. Consequences give some good “barbs” to fences. They let people know the seriousness of the trespass and the seriousness of our respect for ourselves. This teaches them that our commitment to living according to helpful values is something we hold dear and will fight to protect and guard. What falls within our boundaries; what are we responsible for? Feelings – Feelings should neither be ignored nor placed in charge. The Bible says to “own” your feelings and be aware of them. Feelings come from your heart and can tell you the state of your relationships. They can tell you if things are going well, or if there is a problem. But, your feelings are your responsibility and you must own them and see them as your problem so you can begin to find an answer to whatever issue they are pointing to. Attitudes and Beliefs – Attitudes have to do with your orientation toward something, the stance you take toward others, God, life, work, and relationships. Beliefs are anything that you accept as true. We need to own our attitudes and convictions because they fall within our property line. We are the ones who feel their effect, and the only ones who can change them. People with boundary problems usually have distorted attitudes about responsibility. They feel that to hold people responsible for their feelings, choices, and behaviors is mean. Behaviors – Behaviors have consequences. To rescue people from the natural consequences of their behaviors is to render them powerless. Choices – We need to take responsibility for our choices. A common boundary problem is disowning our choices and trying to lay the responsibility for them on someone else. We think someone else is in control, thus relieving us of our basic responsibility. We need to realize that we are in control of our choices no matter how we feel. Throughout Scripture, people are reminded of their choices and asked to take responsibility for them. Making decisions based on others’ approval or on guilt breeds resentment. Setting boundaries inevitably involves taking responsibility for our choices. We are the ones who make them. We are the ones who must live with our consequences. Values – What we value is what we love and assign importance to. Often we do not take responsibility for what we value. When we take responsibility for out-of-control behavior caused by loving the wrong things, or valuing things that have no lasting value, when we confess that we have a heart that values things that will not satisfy, we can receive help from God to “create a new heart” within us. Boundaries help us not to deny but to own our old hurtful values so God can change them. Limits – Tow aspects of limits stand out when it comes to creating better boundaries. The first is setting limits on others. In reality, setting limits on others is a misnomer. We can’t do that. What we can do is set limits on our own exposure to people who are behaving poorly; we can’t change them or make them behave right. God sets standards, but He lets people be who they are and then separates Himself from them when they misbehave. But God limits His exposure to evil, unrepentant people, as should we. Scripture is full of admonitions to separate ourselves from people who act in destructive ways. The other aspect of limits is setting our own internal limits. We need to have spaces inside ourselves where we can have a feeling, an impulse, or a desire, without acting it out. We need self-control without repression. We need to be able to say “no” to ourselves. This includes both our destructive desires and some good ones that are not wise to pursue at a given time. Talents – Our talents are clearly within our boundaries and are our responsibility. Yet taking ownership of them is often frightening and always risky. The parable of the talents (Matt. 25:23, 26-28) says that we are accountable — not to mention much happier – when we are experiencing our gifts and being productive. It takes work, practice, learning, prayer, resources, and grace to overcome the fear of failure that the “wicked and lazy” servant gave in to. He was not chastised for being afraid; we are all afraid when trying something new and difficult. He was chastised for not confronting his fear and trying the best he could. Thoughts – Establishing boundaries in thinking involves three things. We must own our own thoughts. Many people have not taken ownership of their own thinking processes. They are mechanically thinking the thoughts of others without ever examining them. Certainly we should listen to the thoughts of others and weigh them; but we should never “give our minds” over to anyone. We must grow in knowledge and expand our minds. One area in which we need to grow is in knowledge of God and His Word. We must use our brains to have better lives and glorify God. We must clarify distorted thinking. We all have a tendency to not see things clearly, to think and perceive in distorted ways. Taking ownership of our thinking in relationships requires being active in checking out where we may be wrong. Also we need to make sure that we are communicating our thoughts to others. Many people think that others should be able to read their minds and know what they want. This leads to frustration. Desires – Our desires lie within our boundaries. Each of us has different desires, wants, dreams, wishes, goals, plans, hungers, and thirsts. We all want to be satisfied, but too often we are not. Part of the problem lies in the lack of structured boundaries within our personality. We can’t define who the real “me” is and what we truly desire. Many desires masquerade as the real thing. We often do not actively seek our desires from God, and those desires are mixed up with things that we do not really need. God is truly interested in our desires; He made them. God loves to give gifts to His children, but He is a wise Parent. He wants to make sure His gifts are right for us. To know what to ask for, we have to be in touch with who we really are and what are our real motives. Love – Many people have difficulty giving and receiving love because of hurt and fear. Having closed their heart to others, they feel empty and meaningless. We need to take responsibility for our God-given loving function and use it. Love concealed or love rejected can both kill us. Many people do not take ownership for how they resist love. They have a lot of love around them, but do not realize that their loneliness is a result of their own lack of responsiveness. Often they will say, “Others’ love can not ‘get in. '” This statement negates their responsibility to respond. We maneuver subtly to avoid responsibility in love; we need to claim our hearts as our property and work on our weaknesses in that area. Considering all of the above, setting boundaries and maintaining them is hard work. But it is worth it!